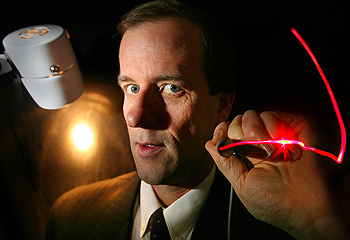 Dr Relf from Freemason's Medical Centre - East Melbourne, who has trained doctors and specialists in the use of laser acupuncture at Monash University and Epworth Hospital Melbourne, said laser acupuncture had been practised for about 20 years but was still relatively unknown by the public. A study by Sydney-based doctor Roberta Chow in 2009 found laser acupuncture significantly reduced chronic neck pain. Dr Yuen and researchers from the Northern Hospital and RMIT hoped to add to the evidence base, with a study measuring the impact of laser acupuncture on migraine and lower back and ankle pain.